Logging into your social networks and following your fridge, microwave, or stove, seems a little farfetched, doesn’t it? Well, get comfortable, because that future is here. The day and age is coming, where your fridge will message or notify you about a product you need to purchase from the store, because it knows you’re driving home from work using GPS information from your phone. The Internet of Things encompasses a wide range of home appliances, city functions and etc, that are aimed at making life easier through network connectivity. 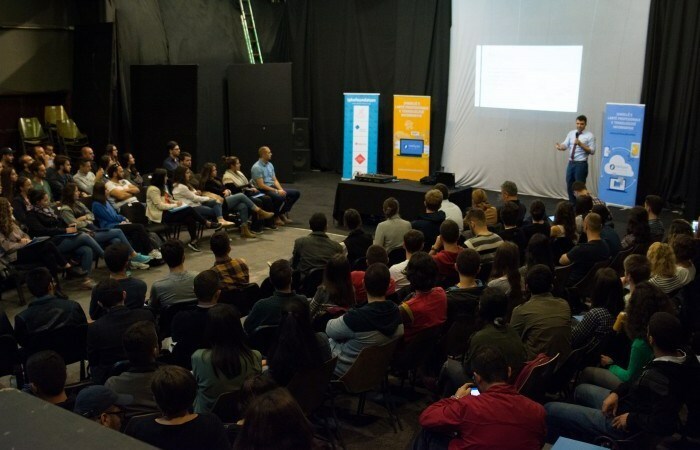 Such are the things that were discussed at BarCamp Prishtina, the #39th edition, opening the door to a whole new world of technology and ways of living that were previously thought of only in Sci-Fi movies. Agim Bekaj from Microsoft, started his presentation with Microsoft Azure, a Microsoft Platform that offers a cloud for you to use in order to create your own “Internet of Things.” This platform plans to increase its user base exponentially in the future as it allows them to easily upload different media or even applications to test, use, and create a streamlined experience for all fans of The Internet of Things. Just in the year of 2014, according to Agim, there were 2.3 billion dollars of investments going towards the development of the internet of things for different offices, companies and even individuals. There is a great future for youngsters who want to work this area, as the whole world will be moving faster and faster towards the internet of things, integrating technology into our normal life routine. Ernest Culaj had worked in IT ever since his university years, and has been part of Albasoft Group since the year 2009. His definition of The Internet of Things, although a technical one, stated that “The Internet of Things connects appliances that are identifiable on the currently existing internet structure.” Most of the things that surround us now have a part integrated, whether via bluetooth or wirelessly, that connects to the internet and communicates with us or other appliances that are networked. In 60 seconds according to Ernest, unimaginable numbers of data go through the internet, more specifically, 400 hours of YouTube videos are uploaded, 205.6 million emails are sent, 3.3 million Facebook posts are made, 3.1 million google searches, 55,555 Instagram photos are uploaded, 422,000 Tweets, and 1,212 WordPress posts, according to a 2015 research. In other words, everything that is created and surrounds us today, in one way or another tends to connect to the internet. “By the year 2025, we expect that everything will be connected with everything else, with minimal third party interference.” claimed Ernest, adding that the world is unavoidably heading towards a very connected, very networked way of living, where there will even be smart cities. “Imagine a world where everything that surrounds us is a smart device”, Ermal Sadiku asked the audience to imagine. “Well, friends, that world is already here”, he added after the participants were able to think for a few seconds. Today’s world is very different and technologically advanced, and we are connected to the internet in one way or another. “We are connected to the internet at all times, and are endangered by evil-doers at all times during our online presence”, warned Ermal, not with the aim to scare the audience from their internet usage, but to urge them to be more careful and attentive to their online presence and the information that they upload online. Leutrim Blakaj’s presentation, although modest in content, carried with it great ideas for contemplation about where technology is headed. “Everything can talk! Maybe in the future we will be able to communicate without words, just using the chips in our brains.” Leutrim is a very successful entrepreneur and leader, having learned from both failure and success. “In our first company we had 1000 clients, but in the following year we had 0 clients. This came as a result of us not being able to maintain a client base,” stated Leutrim as he shared his experiences with the audience. According to him, there will come a day when plants will be able to notify you about their moisture, environment and sunlight, so you don’t forget to water them and keep them healthy. The Internet of Things will be used by the majority of the companies in the future because of its ease of access and different options, and we are looking at a great future in front of us. Vildane Kelmendi took the stage towards the end of the #39th edition of BarCamp, to both represent Cacttus Education as the partnering organizer as well as to present the learning opportunities that they provide for ambitious students. Cactus Education incorporates many aspects of IT, creating the space and motivation for aspiring tech-lovers to advance both academically and professionally. Although it might take a little bit of time for our appliances to start following us on social networks in Kosovo, we are glad we could inspire a glimpse of what the future holds as far as technology is concerned.